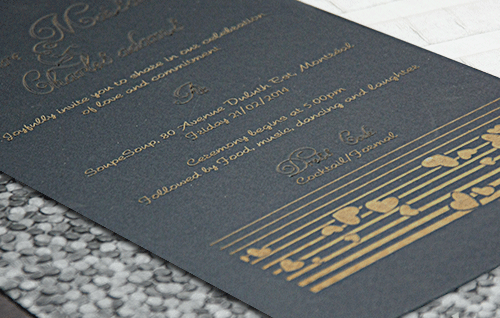 With our laser cut and or laser engraved cards, your invitation is sure to stand out in the crowd. Since the graphics and text is laser cut and or engraved this line of cards also promise to last forever. They will bear through all the seasons, never fading, and never losing their charm. For the bride who wants a card that will stand the test of time, for a bride brave enough to try something new, and something different, this is the bold choice to make. The rich textures, and bold graphics of these invitation are sure to wow your guests. Like our other lines of invitations, these too can be completely customized to meet and match your needs. We offer you a variety of options that you can pick from, including the option of the blooming ecovite. Not only will your card stand out, but it will bloom into a gift that will keep on giving, long after your event is done. As with our other lines of invitations, you will have the options of an integrated invitation, or a stand alone invitations, with matching pockets for your invitations. As well, is the option of having a belly band, for completed integrated look. Express your heart's whispers with these handmade invitations. By combining our talents and with your vision, we customize each invitation to meet your unique and individual style. What whispers will your invitation share with your loved ones?